Home / Press / FIBEGA with the support of the World Tourism Organization (UNWTO) presents "New Technologies in Gastronomy Tourism"
FIBEGA with the support of the World Tourism Organization (UNWTO) presents "New Technologies in Gastronomy Tourism"
FIBEGA Miami 2019, with the support of the World Tourism Organization (UNWTO), will present a seminar in which the role of technology, innovation and its practical application within gastronomy tourism will be addressed. 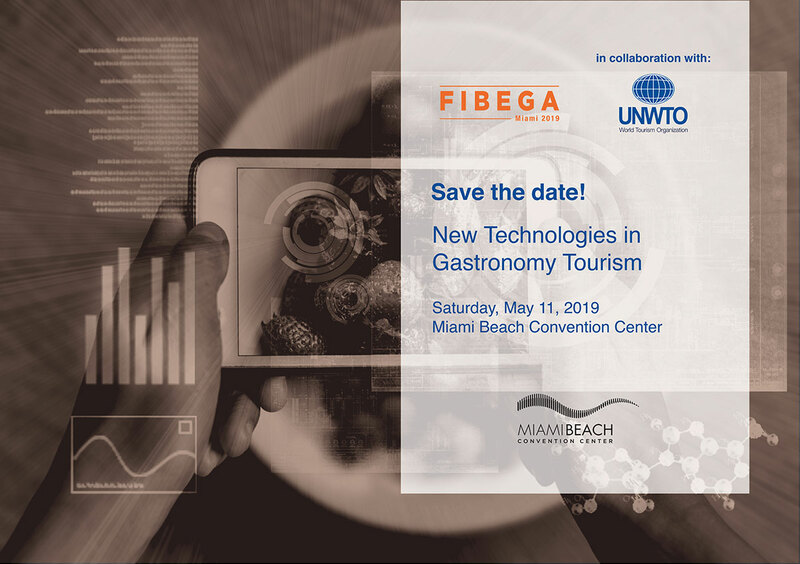 "New Technologies in Gastronomy Tourism"
May 11, 2019, in Hall A of the Miami Beach Convention Center, from 11:00 am until 4:30 pm. This seminar addresses the role of technology, and its practical application in the key businesses of the sector. Amongst the several discussion panels, we will take an in-depth look at the tools created in recent years and their contribution to significantly transform the world of travel and in particular in the emerging gastronomy tourism sector. Conversations will delve into such decisive issues as the media's role in the creation and enhancement of gastronomy tourism destinations, and how influencers and social networks impact this growing industry. This will be an excellent opportunity to discover the principle techniques used to maximize online platforms and to take full advantage of the data collection tools that are currently in place and continuously evolving. During the fair, the finalists and winners of the 1st World Gastronomy Tourism Start-up Competition, an initiative of the World Tourism Organization (UNWTO) and the Basque Culinary Center, will be invited to present their pitches. This competition aims to identify new companies that will lead the gastronomy tourism sector in the coming years. "Gastronomy tourism offers a natural potential to stimulate a sustainable economy, from the local to the national level. It involves many steps along the tourism value chain, ranging from agriculture to gastronomic innovation,” UNWTO Secretary-General, Zurab Pololikashvili. From May 10 to 12, industry professionals from around the world will meet at the Miami Beach Convention Center to share their expertise and immerse themselves in the world of gastronomy tourism. FIBEGA Miami 2019 will be the meeting point for this emerging sector.